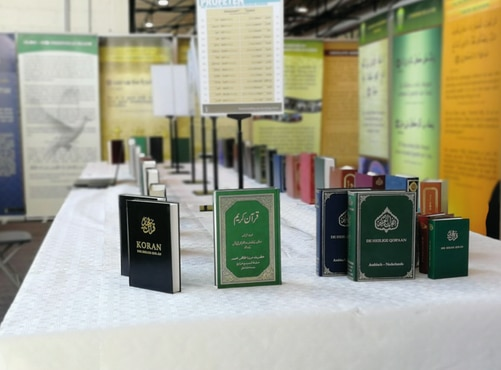 Friday, 14 September was the first day of Jalsa Salana Belgium. The day started with Fajr prayer led by Hazrat Khalifatul Masih Vaa in the Baitus Salam Mosque, Dilbeek. Later, in the afternoon, Huzooraa travelled from the Baitus Salam mission house to the Jalsa Gah at Goot-Brijgaarden. Arriving there at 2pm local time, Huzooraa hoisted Liwa-e-Ahmadiyyat (flag of Jamaat-e-Ahmadiyya) and led the congregation of hundreds of Ahmadis that were present in silent prayer. As this prayer was being broadcast live on MTA, millions of Ahmadis around the world followed their Imam by joining the prayer. From the platform where the Liwa-e-Ahmadiyyat and the national flag of Belgium were hoisted, Huzooraa proceeded to the main hall of the Jalsa Gah and delivered the Friday Sermon. In his Friday Sermon, Huzooraa shed light on the purpose of Jalsa Salana and highlighted that the Promised Messiahas intended for these Jalsas to bring about a spiritual progress in all attendees. Huzooraa said that if this was the purpose to be attained from the one Jalsa that was held in those times, we can imagine how this purpose becomes even more paramount when some members of the Jamaat get the chance to attend more than one Jalsa a year. Huzooraa explained how the Promised Messiahas, once, had not permitted to hold the Jalsa for having felt that the attendees were not fully benefitting and attaining the required objectives. Huzooraa, in light of this, reminded the Jamaat that Jalsa Salana should never be taken as merely a gathering where one gets to socialise, but it should be taken as a great opportunity to enhance our connection with Allah the Almighty. The flag hoisting ceremony and the Friday Sermon by Huzooraa marked the official start of the 25th Jalsa Salana of Jamaat-e-Ahmadiyya Belgium. The first formal session started at 5pm local time. A number of dignitaries were also in attendance, three of whom expressed their impressions about the Jamaat. These dignitaries included Lieve Wierinck, member of European Parliament and Cristiane de Koninck, police commissioner. The first speech of this session, after the recitation of the Holy Quran and poetic writings of the Promised Messiahas, was delivered by Dr Idris Ahmad Sahib, Amir Jamaat Belgium. His speech covered various aspects of the importance of financial sacrifice in the way of Allah. This was followed by a speech delivered by the Hon Francis Stijnen, Mayor of Turnhout. The next speech was by Asad Mujeeb Sahib on The Existence of God. The various efforts of Jamaat-e-Ahmadiyya to spread the message of Islam in the West were covered in a speech by Nazir Degroef Sahib. This brought the first session and the first day to its close. Huzooraa, in his Friday Sermon, told the attendees that since it was the first time that Jamaat Belgium was hosting such a large number of guests, arrangements for food might not seem up to the mark and that guests should show patience in such situations, should they occur. Jamaat Belgium took it upon itself to not disappoint the guests of the Promised Messiahas in any way. Karimullah Mangat Sahib, Nazim Ziafat at Jalsa Belgium, told Al Hakam that his team made their utmost effort to ensure that food was not short and that it was served to all guests at the proper time and in the best possible manner. The second day started with Fajr prayer led by Hazrat Amirul Momineen, Khalifatul Masih Vaa. The highlight of this day was to be Huzoor’s address delivered at the ladies’ Jalsa Gah. This was scheduled at around 12pm local time. Before this, the second session of Jalsa, or the first session of the second day in men’s Jalsa Gah started at 10:30am. Recitation of the Holy Quran and nazm were followed by two speeches by Anwar Hussain Sahib and N A Shamim Sahib on The Promised Messiahas as Hakam and Adal (arbitrator) and The Islamic Way of Matrimonial Life respectively. Huzooraa arrived in the ladies’ Jalsa Gah at 12pm where, after the recitation of the Holy Quran and nazm, he distributed awards to the women who had achieved academic excellence. This was followed by Huzoor’s address to Lajna (women members) in which Huzooraa shed light on the importance of upholding one’s faith in any given situation. Huzooraa cited examples of women who had faced extreme conditions but had not compromised their faith. Huzooraa said that the majority of families settled in the Western countries had fled religious persecution in Pakistan and these countries guaranteed religious freedom. Hence, it should always be remembered that our first responsibility, living in the West, should be to practice our faith and teach our children to do so. The younger generation should be informed that the primary purpose of migrating from Pakistan was to be able to practice our faith so that they can also bear in mind the importance of doing so at all times. Huzoor’s address was followed by Zuhr and Asr prayers with lunch afterwards. Late afternoon saw the second session of the day, and the third session of this Jalsa commence with the recitation of the Holy Quran and nazm. The two speeches of this session were delivered by Haseeb Ahmad Sahib and Tauseef Ahmad Sahib on The Martyrs of Ahmadiyyat and A Living Relation with Khilafat respectively. Before concluding the session, Abdul Majid Tahir Sahib, who was presiding the session narrated some faith-inspiring incidents about Hazrat Khalifatul Masih Vaa. With this, the session concluded. During the course of the day, Hazrat Khalifatul Masih Vaa graced two meetings. The first meeting was with mayors and politicians and other dignitaries. As the former Mayor of Dilbeek, Stefaan Plateau arrived slightly late, he decided to sit at the back of the room. When Huzooraa noticed this, Huzooraa requested him to come forward and referred to the practice of the Holy Prophetsa of Islam that he would have leaders sit at the front. The second meeting was with representatives of the media who came from Arabic, Dutch, French and Urdu media outlets. Huzooraa spoke to them on contemporary issues in light of Islamic teachings and answered their questions. After this, Huzooraa led the attendees of Jalsa Salana in Maghrib and Isha prayers. This brought the second day of Jalsa to a close. The third day, like the past two days, started with Tahajjud prayer, followed by Hazrat Khalifatul Masih Vaa leading the congregation in Fajr prayer. The first session of the day, which was the fourth session of Jalsa, commenced at 10:30am with the recitation of the Holy Quran and nazm. The three speeches delivered were on the topics of The System of Wassiyat, The Holy Prophetsa as an Ambassador of Peace and The Evils of Narcotics and Sexual Perversion. These speeches were delivered by Afzal Ahmad Tauqeer Sahib, Hafiz Ehsan Secunder Sahib and Tahir Nadeem Sahib respectively. Hafiz Ehsan Secunder Sahib’s speech was in French. The final session commenced with the arrival of Hazrat Khalifatul Masih Vaa in the Jalsa Gah, after Zuhr and Asr prayers. Before the session formally commenced, Huzooraa invited certain dignitaries to come and speak to the Jalsa congregation. Tilawat was followed by Urdu and then Arabic poetic verses of the Promised Messiahas. Belgian students who had achieved academic excellence in the recent past were fortunate to receive academic awards and medals from Huzooraa. Secretary Talim announced their names as they came to the stage to receive their awards and medals from Huzooraa. Tauseef Ahmad Sahib, Sadr Majlis Khuddam-ul-Ahmadiyya Belgium requested Huzooraa to present the Alam-e-Inami (flag of distinction) to the Majlis that stood first in overall performance during the year. This was followed by the highlight of the day – the concluding address by Hazrat Khalifatul Masih Vaa. Huzooraa reminded the Jamaat that we are extremely fortunate to be among those who have accepted the Imam of the Age, Hazrat Mirza Ghulam Ahmadas, the Promised Messiah and Imam Mahdi. While the world wanders in confusion, we are fortunate that we have the teachings of the Promised Messiahas to guide us to Allah the Almighty and save us from wandering off to other sources in search of peace. Huzooraa spoke on the expectations the Promised Messiahas had from his Jamaat and that the foremost was attaining taqwa [piety and fear of Allah] and progressing in it. Huzooraa presented, from the writings of the Promised Messiahas, the words that work as a lighthouse to guide to the One and Only God. Huzooraa stated that just as the companions of the Holy Prophetsa brought about such a magnificent change in themselves that many would only accept Islam by observing this change, similarly the Promised Messiahas expected Ahmadis to bring about the same level of change in themselves so as to attract others to accepting Islam. Huzooraa concluded his address with silent prayer after which he announced that the total attendance of the Jalsa had been 3,878 with a representation of 24 countries. Huzooraa remained in the Jalsa Gah and listened to taranas (choral poems) in which various groups expressed, in melodious tunes, their emotions in poetic form. “In January this year, a group of Atfal visited London and had a mulaqat with Huzooraa. I was accompanying them and had the blessed opportunity to be in the mulaqat. I was even more fortunate to request Huzooraa in this mulaqat to grace our Jalsa with his blessed presence. Huzooraa, with a graceful smile, replied that he would do so if we were able to have an attendance of 5,000. I replied that we would Insha-Allah try our best to do so. Upon our return, Amir Sahib Belgium wrote to Huzooraa requesting him to bless our Jalsa with his attendance. We got a reply in the middle of June and to our utter joy and pleasure, Huzooraa accepted our request. Temur Saeed Sahib, Nazim Car Park, also spoke to Al Hakam on Saturday afternoon. He mentioned that parking was one of the main challenges this year as many guests had travelled from other European countries on their own cars.